Cook The Book Fridays is cooking through David Lebovitz's cookbook, My Paris Kitchen, and the selection for this week is Sardine Spread. We love sardine as a filling for sandwiches and I was really looking forward to make this. I use two cans of sardine packed in extra virgin olive oil. Drain the sardines and discard the oil. Remove the bones from each piece of sardine. Mix the cream cheese and butter in a bowl and add the sardine, mashing them to combine. Cream cheese is an interesting ingredient here. Add some chopped scallions, capers, lime juice, salt, black pepper, cayenne powder to taste. Mix everything together. That's it! This has got to be the most simplest recipe from this book, so far! Simple and delicious! We had the Sardine Spread with my homemade Olive Oil Focaccia, made into a sandwich, with lettuce leaves and slices of cheese, for dinner. The family loved it. I have always used canned tuna for making similar sandwich spread like this, but instead of using cream cheese and butter, I have always used mayo. Now, this Sardine Spread, has a place along with my favourite tuna spread. I will definitely be making this again. Do stop by CtBF to view everyone's take on this delicious Sardine Spread. If you have the book or thought of getting one, please do, and join us! Full details here. I've recently added to my cookbook collection, this fabulous book, The Hot Bread Kitchen Cookbook, which I have been eyeing ever since it was published. This book is fast becoming one of my favourite books on breads. 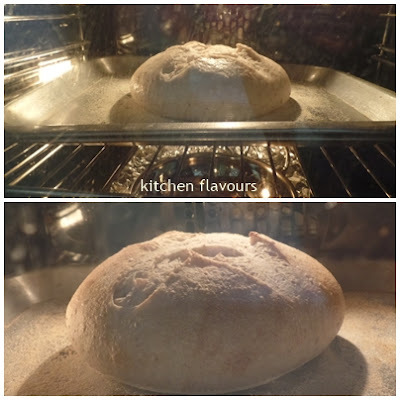 There are many recipes which I could not wait to try, but first I must try one of my favourites flatbreads, foccaccia, which looks absolutely fabulous from the photo in the book. The recipe makes quite a large flatbread, so I have made only half a recipe, using a 13x9-inch pan. There are some variations given for the topping, but I've decided to make it plain as it is, as I wanted to use it for a sandwich later on. The dough is pretty easy to work with. I did not use all of the water indicated, remaining a few tablespoons behind. This is due to the high temperature and humidity in our weather. The final dough however refused to fill the entire pan, so I have left it to rest for 10 minutes at 3 intervals before the whole pan was filled with the dough. This is a fabulous facaccia! The bread is soft, moist and good to eat on its own. I've made it twice already. The first time I've made it, my nephew came for a visit, ate a few pieces and took home the rest, except for one piece, as I wanted to see if it stays just as soft on the next day. It still remains soft on the next day! On the next day, I baked this bread again. We had it as a sandwich bread (will share that in next post), and between the four of us, we finished this whole tray of this Olive Oil Focaccia. No leftovers! I will be trying out the different topping variation the next time. This is a keeper recipe. Stir together the yeast and water in the bowl of a stand mixer fitted with a dough hook. Add the flour and mix on low speed until the ingredients are well combined. Mix on medium speed until the dough looks like thick muffin batter, about 2 minutes. Turn the mixer off and allow the mixture to sit for 10 minutes to allow the flour to hydrate. Add 2 tablespoon of the olive oil and the salt and sugar and mix on low speed until combined, about 1 minute. Turn the speed up just a notch and mix until the dough is quite thick and starting to pull away slightly from the sides of the bowl, about 3 minutes. It will be very sticky at this point. Increase the speed to high and let the dough mix until it comes together, makes slapping noises as it turns, the bowl is clean, and there's a slight sheen to the dough, about 6 minutes. Do a windowpane test to ensure that the gluten is fully developed. Coat the inside of a large bowl with olive oil and transfer the dough to it. Fold the dough over itself a couple of times, cover the bowl with plastic wrap (or put the entire thing into a large plastic bag), and let it rise at room temperature until it is 1-1/2 times its original volume, about 2 hours. Generously oil a 13x18-inch rimmed baking sheet. Remove the dough form the container with oiled hands and press the dough into the pan with your fingers so it evenly covers the pan. If the dough resists, simply let it rest for 10 minutes and then stretch it a bit more. Repeat this process as many times as needed until the dough willingly stretches to cover the entire surface of the pan. Loosely cover the focaccia with plastic wrap and let it rest for 30 minutes. Uncover the dough, use your fingers to firmly dimple the surface. Press down until you feel the hard surface below, being careful not to tear your dough. Use a pastry brush to paint the focaccia with 2 tablespoons olive oil and then sprinkle it evenly with 1 teaspoon salt. Bake the focaccia until it's nicely browned and the underside is crisp, about 30 minutes. Remove to a wire rack and let cool for at least 10 minutes before slicing and serving. Store leftovers in an airtight plastic bag at room temperature for up to 2 days. Reheat in a 300F/150C oven for a few minutes. I've made Aromatic Vegetable Curry with Mushrooms and Beans. I have made a few changes to the recipe. This is pretty much a basic vegetable curry, and you can use whatever veggies you have in your fridge. I did not have any mushrooms, but I have a quarter of a cabbage left, so I've used that instead. Instead of using butter to saute the spices, I've replaced with canola oil. And have substitute the heavy cream with coconut milk. Also the recipe indicated that after the veggies are cooked, they are removed to a plate, then the curry liquid is heated until it has reduced a little. At this point, season with salt and pepper, stir in the yoghurt, cream and garam masala. Pour the sauce over the vegetables and serve immediately with rice. I have, however, did it differently. I did not remove the veggies from the curry gravy, but added the yoghurt, coconut milk and garam masala along with the salt and pepper during the last ten minutes or so of cooking the curry. And I have increased the amount of spices, using 1-1/2 times more than indicated in the recipe. This is a very mild curry (even though with the increased amount of spices). And according to the author "here the aim is to produce a subtle curry rather than an assault on the senses". Seeing how mild this curry is, it would be great as a side dish along with some spicy dry meat curry served with rice. Melt the butter in a heavy pan. Add the onions and cook for 5 minutes until soft. Add the garlic and ginger and cook for 2 minutes, then stir in the cumin, coriander, cardamom pods, cinnamom stick, turmeric and finely chopped chilli. Cook, stirring constantly for 30 seconds. Add the potato cubes, aubergine and mushrooms and the water. Cover the pan, bring to the boil, then lower the heat and simmer for 15 minutes. Add the beans to the pan and cook, uncovered, for about 5 minutes. With a slotted spoon, remove the vegetables to a warmed serving, dish and keep hot. Allow the cooking liquid to bubble up until it has reduced a little. Season with salt and pepper to taste, then stir in the yoghurt, double cream and garam masala. Pour the sauce over the vegetables and garnish with fresh coriander. Serve the curry immediately with plain boiled rice. 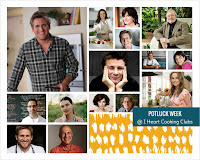 It's Potluck Week at I Heart Cooking Clubs (IHCC). For this week, I've cooked with Yotam Ottolenghi, a fish dish taken from his cookbook "Jerusalem". According to Ottolenghi, Chraimeh is the "queen" of all dishes, just as famous as gefilte fish (another fish dish) for Tripolitan (Libyan) Jews. Families pride themselves on their particular chraimeh. This dish certainly looks delicious from the photo in the book. At a glance it looks like fish cooked in sambal sauce, but upon reading the ingredients list, it is entirely different. He has advised to use any type of white fish meat, the best would be large sea bass. In the recipe, he has used salmon because they are the most widely available as steaks. I have used snapper steaks. He has suggested to double the sauce since it is so tasty, so that there is more to dip with bread, or serve with couscous or rice. I have made one and a half times more of the sauce. To prepare the sauce, first dry-toasted some caraways seeds, then ground. Caraway seeds has a lovely minty fragrant, but once they are dry-toasted, they smell incredibly nice. The ground caraway is then mixed in a food processor or blender with the rest of the sauce ingredients ; garlic, sweep paprika, ground cumin, cayenne, ground cinnamon, green chilli and oil, to a thick paste. The fish steaks are coated with some seasoned flour, heat some oil in a skillet and sear on high heat on both sides until golden, about 2 minutes. Remove and put aside. Heat some oil in the skillet, fry the spice paste for just 30 seconds, then add some water and tomato puree. Bring to a simmer, add some sugar, lemon juice, salt and pepper. Put the fish in the sauce, bring to a gentle simmer, cover the pan and cook until the fish is just done, depending on the size of the fish, about 7-11 minutes. I turned the fish halfway during cooking. Remove from the heat, take the cover off the pan and leave to cool down. Serve just warm or at room temperature, with some chopped coriander and a wedge of lemon. This is quite delicious! We had it at room temperature and it tastes even better when I tasted it right after cooking. I did not squeeze the lemon juice over because the sauce is good as it is. But be sure to add lots of chopped coriander, it makes the dish taste even better! Heat 2 tablespoons of the sunflower oil in a large frying pan for which you have a lid. Place the flour in a shallow bowl, season generously with salt and pepper then toss the fish in it. Shake off the excess flour and sear on a high heat for a minute or two on each side, until golden. Remove the fish and wipe the pan clean. Place the garlic, spices, chilli and 2 tablespoons of sunflower oil in a food processor and blitz to form a thick paste. You might need to add a little bit more of the oil to bring everything together. Pour the remaining oil into the fyring pan, heat well and add the spice paste. Stir and fry it for just 30 seconds, so that the spices don't burn. Quickly but carefully (it may spot! ), add the water and tomato puree to stop the spices cooking. Bring to a simmer and add the sugar, lemon juice, 3/4 of a teaspoon of salt and some pepper. Taste for seasoning. Put the fish in the sauce, bring to a gentle simmer, cover the pan and cook for 7-11 minutes, depending on the size of the fish, until it is just done. Remove the pan from the heat, take off the lid and leave to cool down. Serve the fish just warm or at room temperature, garnished with coriander and a wedge of lemon. A savoury bake that is perfect for brunch or as a light lunch. It is quick, easy and delicious. If you have a pack of frozen puff pasty in the freezer, thaw it overnight in the refrigerator, and by breakfast or lunch time the next day, you will be able to serve this savoury tart in less than half an hour. The actual recipe is named Bacon-And-Egg Breakfast Tarts, but I do not have any bacon. However, I do have a pack of pepperoni which I wanted to use up. The pepperoni makes a delicious substitute. Or even slices of ham will be good too. I've made this tart before with bacon, when I first purchased this book. And we really enjoyed it at that time. Definite worth a repeat! I've used a 4 inch square of puff pastry sheet bought from the supermarket, makes it so much easier, as there's really no need to measure and cut to size. Perfect size for individual serving. The puff pastry is scored on all sides to make a border, then spread in the centre of the pastry to the cut lines, with a mixture of cheddar cheese and sour cream. Bacon or pepperoni slices are pan-fried just until barely crisped. Place a few pieces on the cheese mixture and bake the tart in a preheated oven until the pastry is puffed, crispy and golden, takes about 15-18 minutes. Meanwhile fry the eggs to your liking. When the pastry is ready, place a fried egg on top of each one, sprinkle some black pepper and chopped chives over, and serve immediately. With a cup of warm tea, would be very nice. I drizzled some hot sauce over my eggs. Yums! Enjoy! In the author's own words "Make these for a special brunch, especially if you want to impress your friends or in-laws." Position a rack in the middle of the oven and preheat to 400F (200C). Line a baking sheet with parchment paper. On a lightly floured work surface, roll out the pastry into a rectangle about 12x15 inches (30x38cm). Trim the edges (I like to use a pizza wheel and a ruler to cut puff pastry). Cut the rectangle into 6 equal rectangles, each about 5x6 inches (13x15cm). Using a small, sharp knife, cut a line around each rectangle about 1/2 inch (12mm) from the edge. Do not cut all the way through; you just want to create a ridge when the pastry is baked. Using a fork, prick the pastry inside the line all over. Lay the rectangle on the prepared baking sheet. Refrigerate while you prepare the toppings. In a small bowl, stir together the shredded cheese and creme fraiche. In a large frying pan (it's best to choose a nonstick pan with a lid, so you only have to clean one pan), fry the bacon over medium-low heat until just barely crisped, about 5 minutes. Drain on paper towels. Discard the fat in the pan. While the pastry is baking, fry the eggs. In the large frying pan, warm the olive oil over medium-low heat. Crack the eggs into the pan. Sprinkle with salt and a few grinds of pepper. Cover the pan (this is a handy trick for making beautiful over-easy eggs) and cook until the whites are cooked through and the yolks are still a bit runny. Place the tarts on warmed plates and top each with a fried egg. Sprinkle with chives and serve. The next recipe I've made is Green Fish Curry, which is really a dish of fried fish, marinated first and coated with spices and green cilantro leaves before frying. It is a dry dish, with no curry gravy at all. Any fillet of firm white fish can be used. I have used snapper fillet, which is cut to 2 in cubes. This is the marinating mixture ; shallots, ginger, chillies, coriander, tamarind or lemon juice and salt are processed in a food processor to a paste. This paste is then mixed with the fish pieces and leave to marinate in the fridge, covered for at least 30 minutes. Just before frying gram flour is mixed with a little water and coat the marinated fish evenly. I could not find gram flour and have replaced with a mixture of cornflour and rice flour, equal amount. Heat up some oil and fry the pieces of fish cubes over medium heat until golden brown on both sides and cooked through. Drain and serve immediately. This is the Green Fish Curry! Very nice dish. Aromatic from the fresh coriander leaves. We ate this with plain white rice along with some vegetable curry with gravy. The family likes it. Wash the fish gently under running water and pat dry with absorbent kitchen paper. Cut into 2 in pieces. Place the fish pieces in a large mixing bowl. Process the shallots, ginger, chillies, coriander, tamarind or lemon juice and salt in a food processor or blender. Add the blended ingredients to the fish, and using a metal spoon, mix gently, but thoroughly. Set aside for about 30 minutes. Add the sifted gram flour and 2-3 tbsp water ; if necessary, and mix thoroughly until the fish is coated with the paste. You can add a little more water if the paste is not wet enough, to ensure the fish is coated thoroughly. Heat the oil in a wok or other suitable pan for deep-frying over medium to high heat, then fry the fish in batches for about 2-1/2 minutes on each side until it is a golden brown colour, Drain the fried fish on absorbent kitchen paper and serve with any vegetable or lentil dish, accompanied by plain boiled rice. This week at Cook the Book Fridays (CtBF), the selected recipe is Gazpacho with Herbed Goat Cheese Toasts. I have however only made the Gazpacho and have skipped the Herbed Goat Cheese Toasts. I have never made gazpacho before and was looking forward to try this cold soup. A healthy raw soup, where ripe tomatoes are blanched in boiling water, remove the skins, cut into half, squeezed the seeds out and strain the seed over a strainer into a bowl to collect the juices. Discard the seeds. A piece of bread soaked in water for a minute or two, squeeze out the extra water. The tomatoes, the collected juices and the bread are then processed in a food processor until almost liquefied, with some bits of tomato visible. Pour into a large bowl, mix in finely chopped cucumbers, finely chopped red pepper, finely chopped garlic, red wine vinegar, olive oil, smoked paprika salt and ground black pepper to taste. Add the vodka. Mix well and chill thoroughly before serving. There are mixed reviews when I served this to the family. I thought that this soup was just OK for me. My daughter does not like this soup. But both my husband and son thought that, in their words, "quite nice". Do stop by CtBF to view everyone's take on this soup. If you have the book or thought of getting one, please do, and join us! Full details here. 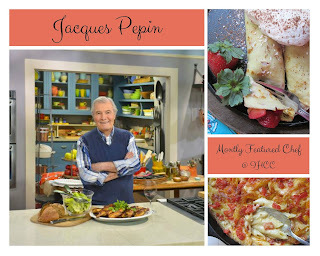 This week at I Heart Cooking Clubs (IHCC), the monthly featured chef is Jacques Pepin. I wanted to make a chicken stew for dinner and found a recipe of his which looks really delicious, Chicken Jardinieri. And intended to serve the stew with a bread that I intend to make on that same day. But that did not happen! I did cook the stew and made the bread, but did not serve them together, because my bread was not quite ready yet at dinner time! I started my bread baking quite late that afternoon, OK, so I did not read the instructions properly and it calls for three risings, instead of the usual two! So I've cooked some plain white rice instead and had it with the stew. This stew is pretty easy to make. And there's bacon in the stew, which is sauteed over high heat for one or two minutes, then the chicken pieces are added in, cooked until both sides are lightly browned. Sprinkle some flour, seasoning, stir to combine, then pour in white wine and water. Potatoes, onions, carrots, mushrooms and thyme are added in. Here, I have used dried thyme, since I do not have any fresh ones. For the mushrooms, I have used fresh small shiitake mushrooms. Bring to boil, reduce heat to low, simmer until the veggies are tender. Add the green peas and cook for a further 2 minutes, then serve immediately. This chicken stew is delicious. We love it. The chicken is tender and tasty, the veggies are soft and the soup slurpingly good. Great with white rice, but I've got to plan my bread baking earlier the next time (and read the instructions properly! ), so that we could enjoy the crusty bread in time, with this stew! Saute the lardons in the oil in a large saucepan or a Dutch oven (the pan should be wide enough to hold the chicken in a single layer) over high heat for 2 minutes. Add the chicken pieces and saute them, turning once, for about 8 minutes, until lightly browned. Sprinkle with the flour, salt, and pepper and move the chicken around to distribute the flour evenly. Cook for 1 minute, then add the wine and water and mix well. Add the potatoes, mushrooms, onions, carrots, garlic, and thyme and mix well. Bring to a full boil, making sure that the stew is boiling throughout, then cover, reduce the heat to low, and cook for 45 minutes (The stew can be prepared ahead to this point and reheated to serve). At serving time, add the peas to the stew, bring to a boil, and boil for 2 minutes. Transfer the stew to individual plates or a large platter, sprinkle with the parsley, and serve. Recipe calls for graham crackers which are lightly crushed to be added to the brownie batter, but I have omitted that and replaced with dried cranberries instead. And I have also reduced the amount of both the white and brown sugars. Position a rack in the middle of the oven and preheat to 350F (180C). Generously butter a 9-by-13-inch (23-by-33-cm) baking dish. In a saucepan, melt the butter and chocolate over low heat, stirring often, about 4 minutes. Remove from the heat and whisk in the sugars. Whisk in the eggs one at a time, beating well after each addition. Whisk in the vanilla and salt. Bake until a toothpick inserted into the centre comes out almost completely clean, 30-35 minutes. Let cool in the dish on a wire rack, then cut into big, gooey squares. I've made Cucumber Raita and Basmati Rice and Peas along with two other dishes for an Indian weeknight meal. I've used my homemade yoghurt to make the Cucumber Raita, and homegrown jalapeno chilli. Lightly perfumed with the ground cumin, very nice raita. I've cooked the basmati rice in the rice cooker. At step 4 after adding the rice, peas and water to the sauteed ingredients, transfer everything to the rice cooker. We had this Basmati Rice and Peas served with Madras Meat Curry, Karahi Potatoes with Whole Spices and Mixed Chillies, along with the Cucumber Raita. Very delicious meal! Wash the rice well under cold running water and leave it to soak in a bowl of water for 30 minutes. Heat the oil in a heavy pan and add the curry leaves, mustard seeds, onion seeds, fenugreek leaves, garlic, ginger and salt and stir-fry for 2-3 minutes. Drain the rice thoroughly, and add it to the pan with the other ingredients. Stir gently to combine. Add the frozen peas and water and bring to the boil. Lower the heat, cover with a lid and cook for 15-20 minutes. Remove from the heat and leave to stand, still covered, for 10 minutes. When ready to serve, fluff up the rice with a fork. Spoon the mixture on to serving plates and serve immediately. Dice the cucumber finely and place in a large mixing bowl. Sprinkle over the chopped green chilli and mix well to combine it with the cucumber. Place the natural yoghurt in a bowl and bear it with a fork until it becomes smooth, then stir it into the cucumber and chilli mixture in the large bowl. Stir the salt and ground cumin into the yoghurt mixture. Cover the bowl with clear film (plastic wrap) and chill in the refrigerator for at least 30 minutes before serving. This week's theme at I Heart Cooking Clubs (IHCC) is "Finishing Touches!". 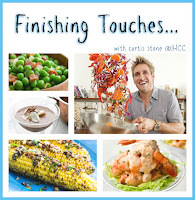 We are to "Make any Curtis Stone dish featuring or including some special finishing touches such as: a sprinkle of this, a dusting of that, sauces, dressings, croutons, condiments, or any other extras that finish your dish with flair!" I've made Curtis Stone's Rum Sultana Pound Cake and the finishing touch is the Lemon Glaze. I love sultanas in bakes and I love using rum too, so I was looking forward to bake this! The sultanas are heated over a low heat with some rum, just to a simmer, then left to cool. I love the aroma of the rum! As with the usual way of making a pound cake, the butter and sugar are creamed together, followed by the eggs, then the flour is mixed in, alternating with the buttermilk. The cooled sultanas with the rum is then added into the batter. Stir to combine and bake as directed in the recipe. I did reduce the sugar for the batter to only 3/4 cup and the sweetness works out great for me. I've increased the baking powder to 1/2 tsp. And since I've used salted butter, I have omitted the salt in the recipe. Originally, the recipe uses lime for the glaze, but I already have some lemons, so I've used lemons instead. My lemon glaze is a little thin, as I have used only about 3/4 cup or icing sugar instead of the full amount of 1-3/4 cups. as I do not like to eat very sweet cakes. I did not measure the lemon juice and the rum. I just squeezed some lemon juice over the icing sugar and added a little rum. Mix and adjust accordingly to the consistency of the preferred glaze. I usually like my cakes without any glaze or frosting, but there's always an exception! This cake is quite good. As with pound cakes, it has a dense texture, but soft and moist. The plump juicy sultanas are a pleasure to bite into, and the taste and aroma of the rum is wonderful. Two slices (one slice is not enough!) is lovely with a cup of warm tea. This cake tasted even better the next day! Position the rack in the center of the oven and preheat the oven to 175C or 155C fan. Spray an 8 cup bundt pan with cooking spray. Bring sultanas and 1/2 cup rum just to a simmer in a saucepan over medium heat. Set aside, stirring occasionally, until plump. Cool. Whisk flour and baking powder in a medium bowl to blend. In the bowl of an electric stand mixer with the paddle attachment on medium speed, beat butter, caster sugar, vanilla, and salt for 10 minutes, our until light and fluffy. Add eggs, one at a time, beating well after each addition. Reduce speed to low. Add flour mixture and buttermilk alternately in batches, beating just until blended. Stir in sultana mixture. Transfer to prepared pan. Bake for 1 hour or until a toothpick inserted near the centre comes out with moist crumbs attached. Cool on a rack for 10 mins. Invert onto a plate or platter and remove the pan. Cool for about 30 minutes. In a medium bowl, whisk icing sugar, lime zest and juice, and remaining 3 tsp rum to form a smooth glaze. Spoon over the warm cake. Serve warm or at room temperature. This potato dish is delicious, it's flavours are from the whole spices and curry leaves, that the sliced potatoes are stir-fried with. The only thing that I need to change when I make this again, is to pre-fried the sliced potatoes until almost cooked before they are stir-fried with the spices. The recipe does not contain any added water, it is a dry dish. And it says to cook the potato covered, for 7 minutes or so over a low heat until the potatoes are tender. I find that the spices and the other ingredients are starting to burn before the potatoes are done. So I have frequently stir the potatoes very often and it takes about 20 minutes or so until they are tender. But this is a delicious potato dish, and I would make this again, but will pre-fried the potatoes separately until they are almost done before frying them with the spices and ingredients, to avoid the spices from being burnt which will spoil a dish! Overall, this is a very nice potato dish, great as a side dish, especially eaten with some curries and rice. Heat the oil in a karahi, wok or heavy pan. Lower the heat slightly and add the cumin seeds, curry leaves, dried red chillies, mixed onion, mustard and fenugreek seeds, fennel seeds, garlic slices and ginger. Fry for 1 minute. Add the onions to the pan and fry for a further 5 minutes, or until the onions are golden brown. Add the potatoes, fresh coriander and red and green chillies and mix well. Cover the pan tightly with a lid or foil; if using foil, make sure that it does not touch the food. Cook over a very low heat for about 7 minutes or until the potatoes are tender. Remove the pan from the heat, and take off the lid or foil cover. Serve hot straight from the pan. It's "August Potluck!" at I Heart Cooking Clubs (IHCC). We are free to select from any of IHCC's past and present featured chefs, and there are 14 chefs to choose from. Going through those chefs' books on my bookshelf, I chose Tessa Kiros's cookbook, Falling Cloudberries, a gorgeous book with many recipes that I want to try! I've selected an oven-baked fish dish, which is so easy and fuss-free. In the recipe, Tessa uses white fish fillet, cut into 2-1/2 inch pieces. I have however used four slices of snapper, leaving it whole. Place the fish slices in a baking dish in a single layer. The rest of the ingredients ; canned chopped tomatoes, chopped parsley, minced garlic, chopped celery, lemon juice, sugar, olive oil are mixed together and season with salt and pepper. I have used cilantro instead of parlsey and have used much more than the recipe calls for. Pour the mixture over the fish, cover with foil and bake for about 30 minutes. Remove the foil, increase the heat and bake for another 40-50 minutes (I bake for 30 minutes). The sauce is bubbling in the oven, looks so yummy. Serve hot. We had it with rice, along with Stir-Fried Sugar Snaps with Garlic for a weeknight dinner. The fish is very soft and the tomato-parsley sauce is very tasty, very nice spoon over rice. As suggested by Tessa, some crusty bread would be lovely to mop up the juices. Put the fish in an oven dish where they will fit in a single layer. Mix together the tomatoes, parsley, garlic, lemon juice, sugar and olive oil and taste for seasoning. Pour over the fish to cover all the pieces, shaking the dish from side to side. Cover with foil and bake for about 30 minutes. Remove the aluminium foil, increase the heat to 200C (400f/Gas ) and bake for another 40-50 minutes, or until the liquid has thickened and the top of the fish is golden in a couple of places. The next recipe selected for this week at Cook the Book Fridays (CtBF) is Spiced Meatballs with Sriracha Sauce. These meatballs are David Lebovitz's take on the North African merguez sausages. To make the meatballs, toast the coriander seeds, fennel seeds and cumin seeds in a small saucepan until fragrant. Leave to cool and grind to a powder in a spice mill. Mix the ground spices in a bowl with chopped cilantro, minced garlic, sweet paprika, harissa, salt, cinnamon, allspice and sumac. Add the ground meat, of which I have used ground pork, and mix well. I left the mixture in the refrigerator for a few hours for the flavours to blend. Pinch off some of the meat mixture about the size of an unshelled walnut, roll them into meatballs. These meatballs can either be fried over the stove or baked in the oven. I baked the meatballs instead of cooking them over the stove. Put the meatballs in a greased baking tray and bake for about 15 minutes until cooked. The meatballs will release some of the oil and juices, and smells fantastic, aroma from all the combined spices! The dipping sauce is made by mixing mayonnaise and sriracha sauce. Very nice! The warm baked meatballs, very delicious! Love the spice taste and aroma in the meatballs. These are very good! We actually had the meatballs with rice, and the tasty liquid from the baking tray is great spoon over the rice with the meatballs. My kids love the dipping sauce, but then they love anything with mayonnaise! Do stop by CtBF to view everyone's take on this delicious meatballs. If you have the book or thought of getting one, please do, and join us! Full details here.